If someone would ask me to make a list of my TOP 5 travel destinations, the list would definitely be incomplete without Cappadocia. 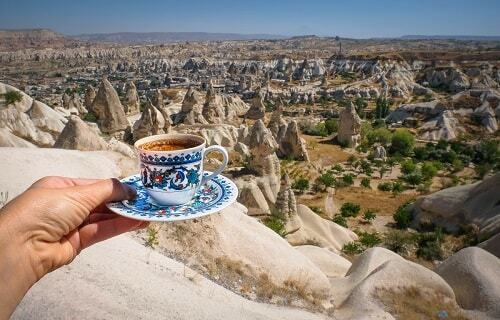 Cappadocia, this Turkish region, is mostly described as fairy chimney landscape and it is truly impressive. 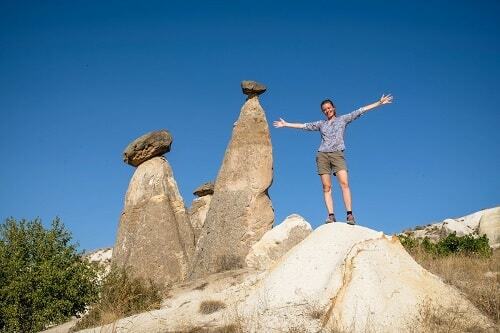 But if you think that fairy chimneys are all what Cappadocia is, you are completely wrong. 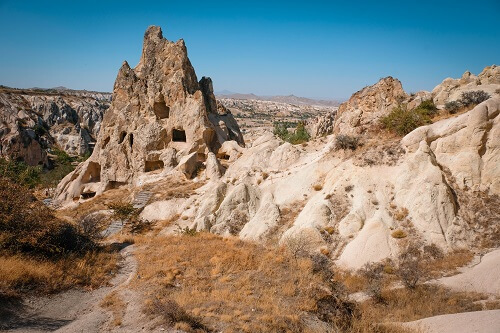 Cappadocia has numerous attractions, which are worth exploring. 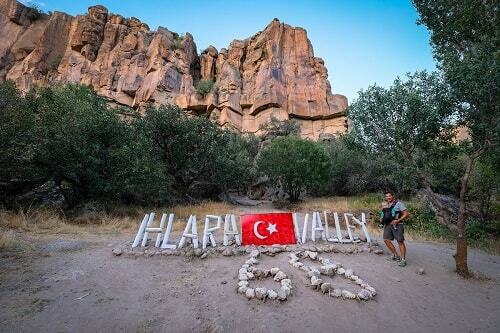 The Ihlara Valley is known as one of the best hiking spots in Turkey. The valley is actually 14 kilometers long canyon and 100 meters deep. You can either start your hike from the Selime village and its monastery or you decide to walk down 350 steps on the other side of the Ihlara Valley. There are also two other, smaller entrances in between – one of them can be reach by car (Bellisirma village / entrance). The whole canyon is green because of the lovely Melendiz stream, what makes it a nice place to hike. The Ihlara Valley is best known for its Greek orthodox churches from the Byzantine era. There are 105 of churches all together, but only 16 are open for visitors. 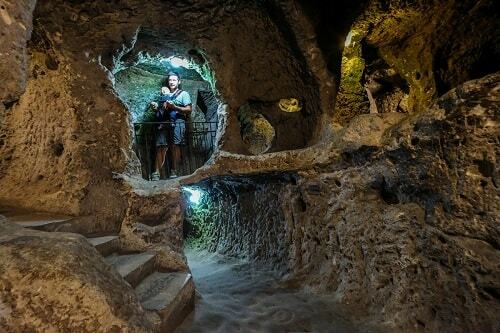 We can find several underground cities in Cappadocia, but two of them are best visited; Kaymakli and Derinkuyu. We decided to visit the largest one – Derinkuyu, which has 18 floors (eight are open to the visitors) and which reach 60 meters in depth. Around 20.000 people, including livestock were able to live there. These kind of underground caves are impressive and due to its construction with airshafts, all the floors got a breeze of fresh air and with that quality of life underground. 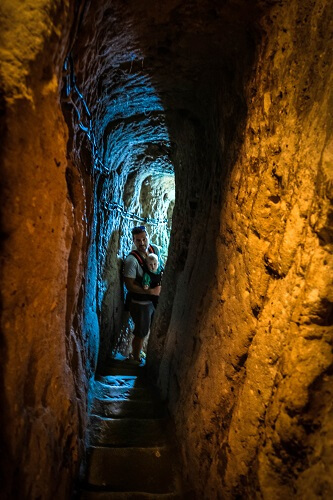 Everything started around 1200 BC and throughout years the Derinkuyu underground city was getting bigger and bigger. Seeing it now, it was completely sufficient and had living quarters, cellar, oil and wine press, water well, kitchen, pastures, cemetery, prison, school and stables. 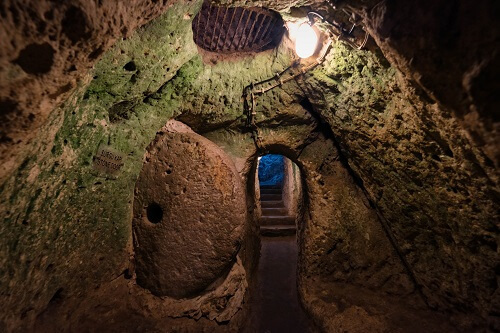 If you’ll visit Cappadocia as a self-organized travel, we recommend you to visit the undergrounds cities (especially Derinkuyu and Kaymakli) as soon as they open, meaning before the bus groups will take over the place and make everything crowded. For everyone traveling there by a rented car, a parking spot near the Derinkuyu is provided, but it is not free of charge (38.37209 / 034.73428). There’s also a lot of local restaurants and cafes around the place and souvenirs stands. 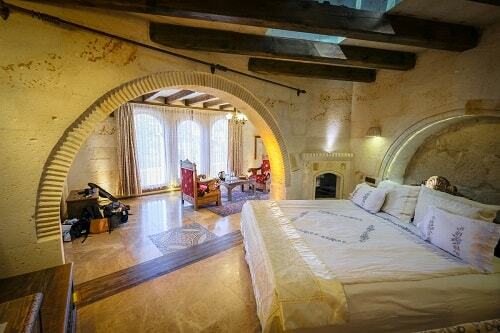 These kind of hotels are a bit pricy, but for a unique experience it is definitely worth to spend a little bit extra. 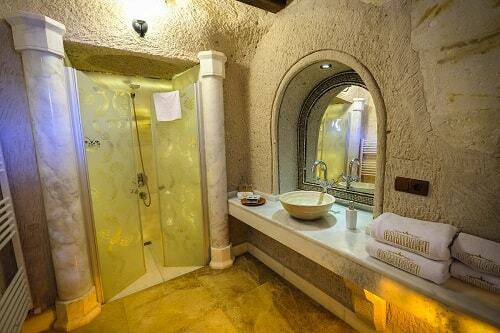 The Gamirasu cave hotel can be find in the center of Cappadocia, around 10-15 minute drive from the Göreme town. The hotel lies in a small village, where you can observe the traditional daily life of local people and most importantly there are no tourists. The hotel has great views over the village and on the abandoned caves, where not long ago people still lived, but are now for sale. 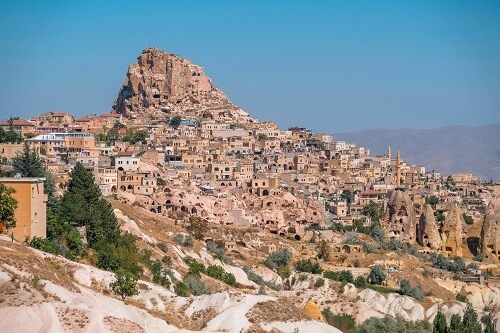 If you’ll be exploring Cappadocia with a rented car (we definitely recommend you to do so), the Gamirasu cave hotel is ideal – but even you won’t have your own transport, the hotel also offers free shuttle to the sights. You can read more about the Gamirasu cave hotel here. You can admire Uçhisar on different ways – you can walk around its narrow streets, go up to the castle or you can see it from afar, along the Pigeon valley. (38.61995 / 034.80493). 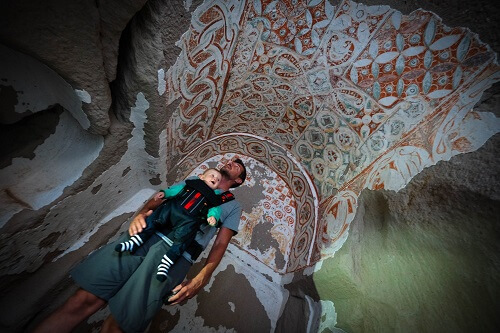 Göreme is some kind of Cappadocia’s capital and you can also find an open air museum there. 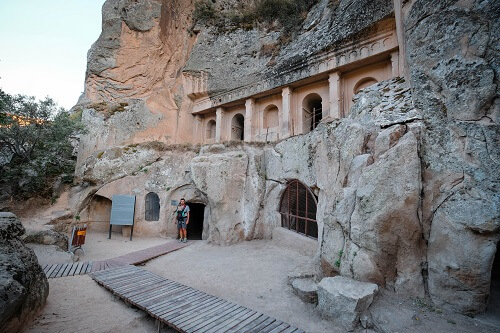 You can walk among the cave churches and their frescoes dated from 10th to 12th century. 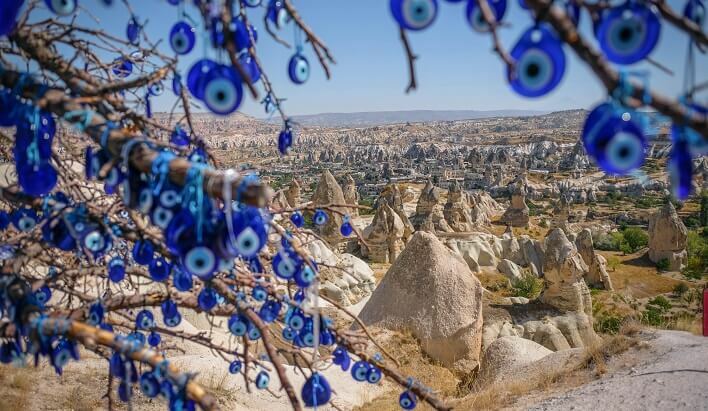 Best and most recognizable souvenir from Turkey is a blue eye, which will protect you against bad luck and thoughts. 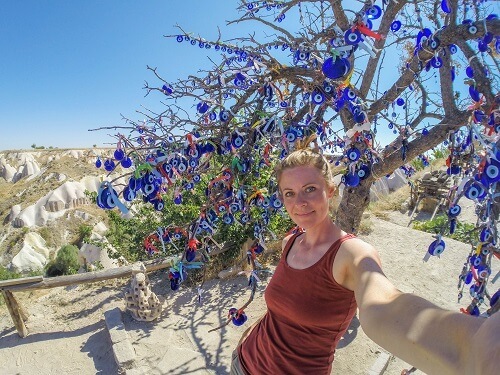 That is why you can find them everywhere – in people’s home, jewelry, cars, buses… You can find a really nice tree in Cappadocia, where you can take a selfie with the numerous blue eyes or you can also hang one up. The blue eyes tree can be find at the view point looking towards the Uçhisar and the Pigeon Valley. (38.61995 / 034.80493). We also find one at the cafe mentioned above. 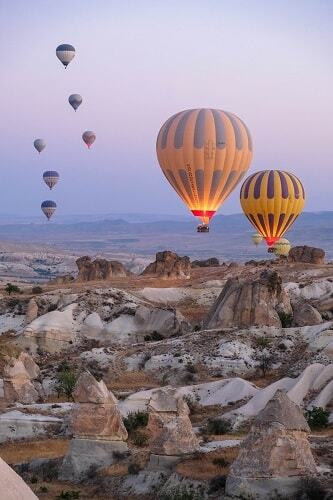 One of the most recognizable things from Cappadocia are also its hot air balloons at sunrise. Seeing full sky of them at sunrise is really one of the best experiences in Cappadocia and a good reason for getting up early. If you’ll be traveling to Cappadocia with kids, they need to be at least 5 years old to join you in the hot-air balloon. The hot-air balloon rides in Cappadocia might not be cheap (120-150 euro/pp), but seeing the landscape from above will definitely not leave you indifferent. We missed this experience this time, but we at least have a good reason to be back. Cappadocia is also well known for its pottery, especially the Avanos village. You can find a pottery museum there, lots of shops and you can also try yourself in pottery if you’d like to make your own souvenir. 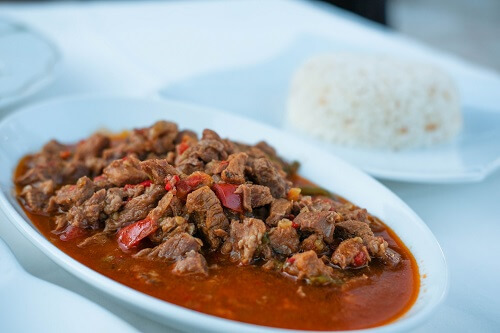 You cannot leave Cappadocia without tasting its own local kebaba called »testi kebab«. 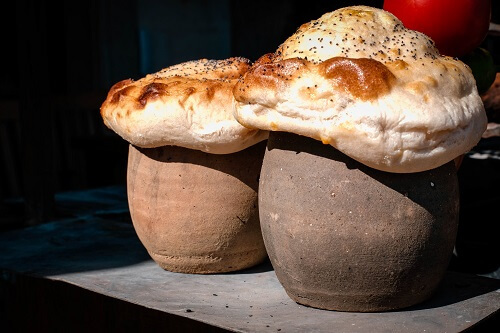 This dish is actually made out of meat and vegetables, put into a pot, covered with bread and put on low fire for few hours, to cook slowly. When you’ll get it served, the waiter will bring you the whole pot, including the bread seal and crash it in front of you to make a show. It goes well with bread or rice – and yes, we loved it. Cappadocia is truly inspiring, unique and magical place. If you have not been there yet, you definitely should put it on your travel bucket list. 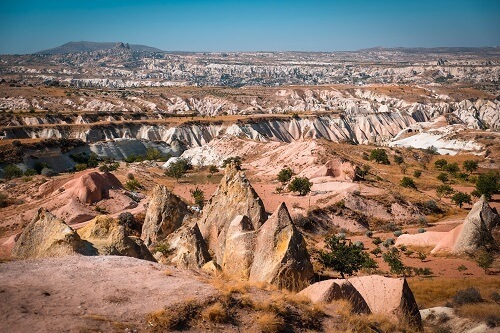 There’s only one danger about Cappadocia – you might like it so much, you want to come back over and over again – I know we do. 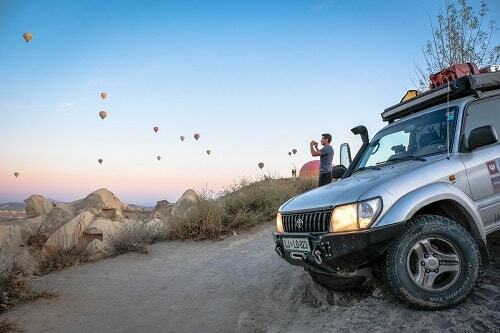 Travel tip: If you’ll be traveling to cappadocia individualy, we recommend you to rent a car for its exploration. So far, we were always very happy with online providor Economy Car Rentals, which has good prices and services.